Based on reviews from 622 experts and 23,650 users. Learn how our rankings work or see our guide to blue basketball shoes. Updated Apr 2019. Basketball started in 1891 but the first basketball shoes became public only in 1917. The first company to produce them was Converse. The Converse All-Star was once available only in black and white colorways. Other companies such as Puma, Adidas, Pro Ked, Nike, and Pony followed in manufacturing basketball shoes. Other colors also started coming out, and there are now a lot of blue basketball shoes to choose from. Major basketball shoe brands produce signature shoes in many colorways, and they may be basic, special editions, player editions, or collaborations. 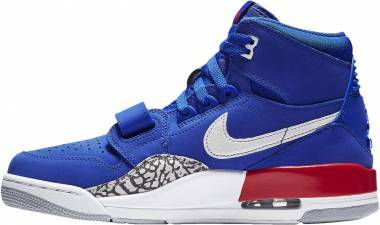 The following sections present some of the most notable blue basketball shoes from each brand. Nike is the largest supplier of athletic shoes in the world. Nothing is impossible with the Swoosh when it comes to technologies that are added to the shoe. To meet the varying style demands of the public, Nike releases their shoe models in different colorways. They even created NikeID for a more personalized experience. Nike LeBron 15. The current favorite of The King, the Nike LeBron 15 outshines the other LeBron James basketball shoes in so many aspects. This one-bootie shoe comes in a reptile-skin-like upper with a visible Max Air unit at the heel, making it more appealing. As if the Max Air unit is not enough, the signature shoe has a Zoom Air unit at the forefoot for additional comfort and responsiveness. The Nike LeBron 15 is also the first ever LeBron shoe to feature Battleknit. It is a high-grade and innovated form of Flyknit that effectively stretches and keeps its shape even after several months of use. The triangular and spiked outsole is made of either solid, translucent, or gum rubber compounds. 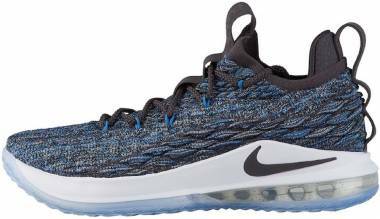 The Nike LeBron 15 has been released in plenty of colorways, including blue ones. New buyers can choose from the South Beach, Hardwood Classics, ACG Mowabb, and Waffle colorways. Nike KD Trey 5 V. The Trey 5 is a series of budget models that honors the Golden State Warriors’ small forward Kevin Durant. The Trey 5 V is known for its lightness and compatibility with speedy players. With a Zoom Air unit at the forefoot, it provides a combination of comfort and court feel. The breathable mesh upper has fuse overlays at the toe cap and midfoot for durability. For multidirectional performance, it boasts a widely-spaced wavy herringbone pattern. The Nike KD Trey 5 V has a unique support feature: its thick round shoelaces are anchored on the exposed lateral lace loops, which help cinch the foot for a more secure lockdown when the laces are tightened. The Nike KD Trey 5 V is available in the Warriors colorway, which is blue with yellow and white accents. Nike Kyrie 4. 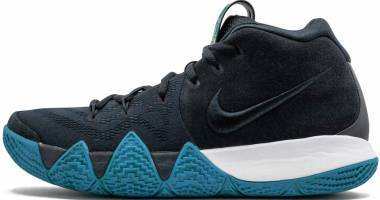 The fourth installment in the Kyrie series comes with a new design. The lateral side shows off some jagged teeth patterns that actually support Kyrie Irving’s quick and aggressive footwork. The upper is made of mesh and leather with Flywire at the midfoot. Such a combination delivers comfort, durability, and foot containment to fast guards. The outsole has a zigzagging herringbone pattern with a deep flex groove at the middle. This pattern ensures shoe flexibility and court control. 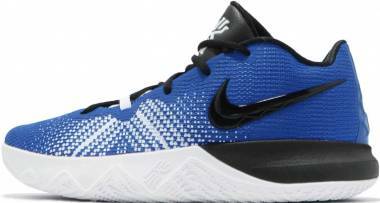 The Nike Kyrie 4 has blue versions such as the Duke Blue Devils PE and Think Twice colorways. Nike Zoom Kobe 5. Kobe Bryant’s signature basketball shoes are known to have classy and elegant designs. In a low-top silhouette, these basketball shoes stand out on and off court. The responsiveness of the Nike Zoom Kobe 5 comes from the Phylon midsole with Zoom units at the forefoot and heel. The traction has a heartbeat pattern. Because of the thin rubber, the shoe is only for clean and indoor courts. The Nike Zoom Kobe 5 has a number of blue versions. Those who want to get Kobe blue basketball shoes may choose from the Dark Knight, Duke, and Draft Days/Hornets colorways. Nike Hyperdunk 2014. The Nike Hyperdunk series started in 2008. Every year, a new model is released, and it usually bears technologies that are better than those in the one before it. 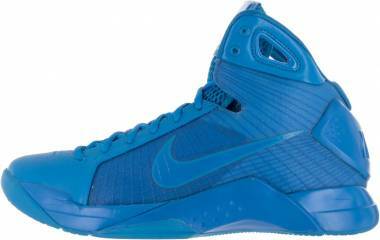 The Nike Hyperdunk 2014 has light and dark blue versions, and Hypermesh compose the upper of these all blue basketball shoes. This material provides more breathability and less bulkiness. Its pressure-mapped traction pattern has thick and widely-spaced grooves, making it fit for both indoor and outdoor use. For support, the shoe model comes with a TPU at the heel and a TPU shank at the midfoot. 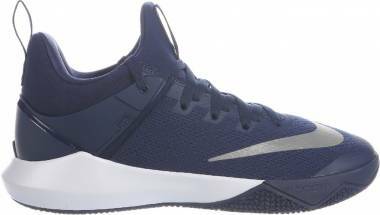 For cushioning, these blue basketball shoes rely on the Phylon midsole that is reinforced by Lunarlon in the forefoot and heel areas. As Nike’s greatest rival, the Three Stripes brand also produces magnificent basketball sneakers. The tight competition between the two brands is not only about the materials, technologies, or the athletes that they sign, it also extends even to matters as simple as colorways. Just like Nike, the Three Stripes also has a shoe customization platform that they call MiAdidas. This online platform specifically allows buyers to change the colors at any part of the shoe including the callouts. Adidas’s roster of signature athletes includes Derrick Rose, Damian Lillard, James Harden, and John Wall. Andrew Wiggins, Nick Young, Brandon Ingram and Ricky Rubio also have existing contracts with Adidas. In fact, they already have exclusive Player Edition shoes in their honor, but we have yet to hear about them finally having their own signature shoes. 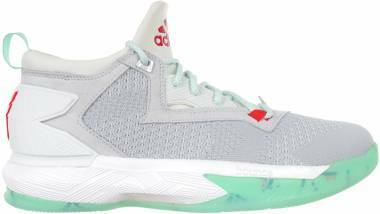 Adidas D Lillard 2. 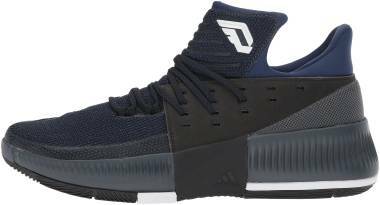 The second signature shoe of Damian Lillard is one of the top basketball sneakers of Adidas. Featuring a full-length Bounce, the Adidas D Lillard 2 sets great cushioning expectations for guards like Damian. The SprintFrame and Torsion systems are placed at the midfoot for a pleasant heel-to-toe transition. The durable continental rubber outsole ensures that the shoe will last. 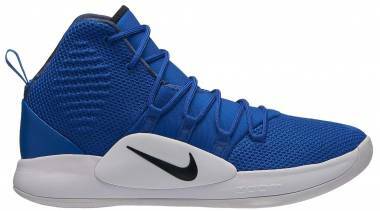 The Techfit bootie upper of these blue basketball shoes comes in a variety of materials, namely Jacquard fabric, synthetic leather, Primeknit, and ordinary knit. Adidas D Rose 7. Derrick Rose has released a wide variety of basketball shoes through his three separate shoe lines. 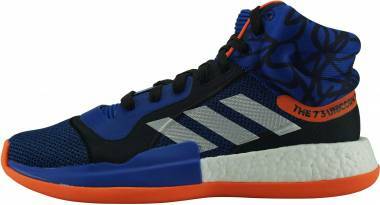 However, it seems that the Adidas D Rose 7 tops as the favorite of most wearers. Its midsole features the famous Boost technology that runs thin at the forefoot and thick at the heel. 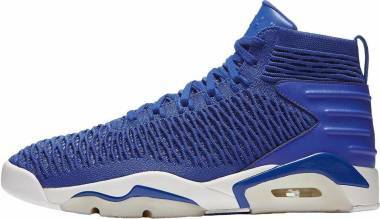 Built with engineered mesh, these blue basketball shoes maintain airflow for a moisture-free wear. Adidas Harden Vol 2. There are a lot of reasons the Harden Vol. 2 is one of the most prestigious shoe models of Adidas. It offers an adjustable lacing system that allows wearers with varying foot widths to enjoy the shoe. Dubbed by users as one of the most comfortable shoes in the market, the shoe model comes in full-length Boost. 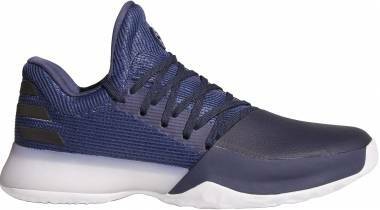 Those who want to have their Adidas Harden Vol 2 as electric blue basketball shoes should pick the Blue Night colorway. Adidas Crazy Explosive 2017. 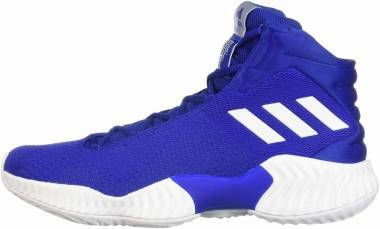 Tagged as one of the best performance shoes of 2017, the Adidas Crazy Explosive comes with killer traction, Boost cushioning, and Primeknit upper. The shoe model comes in a number of player editions. 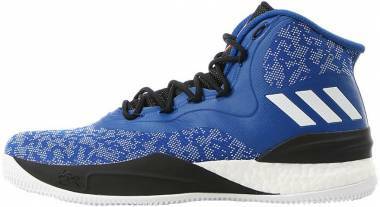 If new buyers prefer all blue basketball shoes, they can opt for an Andrew Wiggins PE. The upper matches the blue chip shade of his team the Minnesota Timberwolves. 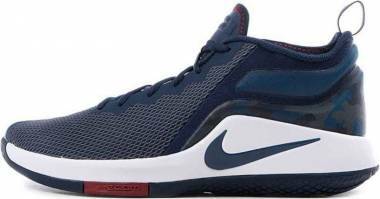 If dark blue basketball shoes are preferred, the shoe model also comes in that colorway. Adidas Explosive Bounce. The Adidas Explosive Bounce features a coral-like traction pattern that needs only minimal wiping even on dusty courts. With the full-length Bounce midsole, the wearer is sure to experience comfort all day long. Support and lockdown are provided by the lacing system and the molded heel piece that wraps the ankle. The Explosive Bounce comes in various blue colorways. Besides dark blue basketball shoes, this model may also come as a pair of light, electric, or aqua blue basketball sneakers. From 1985 to the present, Jordan shoes are among the most sought-after sneakers for basketball, casual wear, or as collectibles. Since Air Jordan kicks are re-released from time to time, more and more colorways are now available. Below are the recommended blue basketball shoes from the the Jordan brand. Air Jordan 11 Retro. The Air Jordan 11 first came out in 1995 at $125. It has been re-released thrice. Designed by Tinker Hatfield, the shoe is constructed using patent leather and carbon fiber. The famous shoe made a cameo in the megahit movie Space Jam. 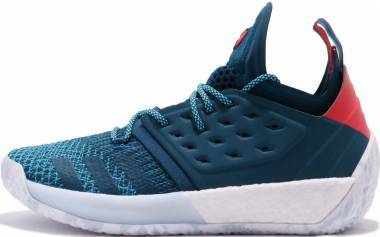 It has a Phylon midsole that is capped with a full-length Air unit to give wearers a huge amount of flexibility and comfort. The upper features breathable mesh, durable patent leather, and nylon strips for support. The Air Jordan 11 Retro is available as dark blue basketball shoes in the 11/12 Championship Pack. Other colorways have blue shades on their patent leather. Air Jordan 7 Retro. The Air Jordan 7 is a witness to Michael Jordan’s numerous achievements such as becoming the Finals MVP and leading the USA team to win the gold medal in the 1992 Barcelona Summer Olympic Games. Because of the Air Jordan 7, the Jordan brand was able to establish its own name while still being a subsidiary of Nike. The exceptional cushioning of the shoe is provided by the Phylon midsole with encapsulated Air units at the forefoot and heel. The dynamic zigzag upper is made of either synthetic or nubuck leather, depending on the colorway. The OG colorway resembles the colors of the West African culture. Other colorways such as the French Blue, Olympic, and Pacific Blue have light blue accents. Those who want dark blue basketball shoes should get the Air Jordan 7 Retro J2K colorway. Jordan B. Fly. The Jordan B. Fly has received love from Michael Kidd-Gilchrist of the Charlotte Hornets, Kawhi Leonard of the San Antonio Spurs, and Jimmy Butler of the Chicago Bulls. In an interview, Gilchrist said, “It’s like a sock, it’s light, it’s controlling — I can go right and go left with ease. I enjoy it.” The Jordan B. Fly boasts an injected Phylon midsole with a Zoom Air unit at the forefoot. 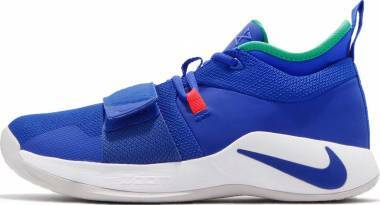 For an explosive small forward like Kidd-Gilchrist, the lightweight midsole gives just the right amount of responsiveness and energy return as he runs, sprints, and jumps on the court. 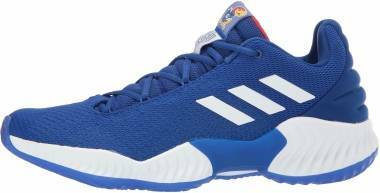 These blue basketball shoes are made of durable and lightweight woven material for a flexible all-game wear. Jordan CP3.X. In October 2016, the tenth Chris Paul shoe was released. It has a performance woven upper with a rubber cage at the lateral side. The quick footwork of point guards need a light and supportive footwear such as the Jordan CP3.X. At the forefoot, the shoe has a nine-chamber Zoom unit that delivers more court feel than impact protection. For additional lockdown and support, the midfoot has Flywire strands that are anchored on the midsole. 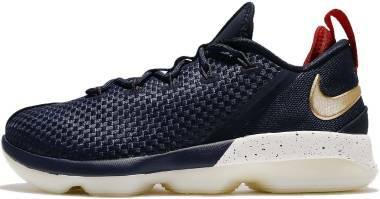 The Jordan CP3.X has a lot of colorways; and the dark blue basketball shoes definitely stand out. Air Jordan XXXI. The Air Jordan series has come a long way that it has reached its 31st model. The AJ XXXI has the same silhouette and low-to-the-ground outline as the Air Jordan 1. It is the first in the series to have an upper with a woven knit front and leather rear panel. For cushioning and stability, the Air Jordan 31 offers a full-length Zoom unit and a FlightSpeed plate. The outsole comes in stylishly delicate translucent rubber. Under Armour Curry 3. When someone mentions Under Armour, Stephen Curry automatically comes into mind. We imagine him throwing three-point shots and landing in his white and light blue basketball shoes: the Under Armour Curry 3. Impact is absorbed by the Charged cushioning and stabilized by the Meta-Wing carbon fiber from the side panels. Floor control is provided by the multidirectional herringbone traction pattern. Point guards like Stephen Curry are speedy; therefore, keeping their feet moist-free all the time is a must. Thanks to its lightweight Threadborne upper, the Curry 3 is able to provide much-needed ventilation. Under Armour Clutchfit Drive 3. It may not have outstanding technologies but the Under Armour Clutchfit Drive 3 is loved by many shoe owners. Based on 114 reviews, the shoe model gets a 91% approval. The Clutchfit Drive 3 is a simple performance shoe that gives wearers a comfortable and responsive ride through its Micro G foam midsole. The Clutchfit technology on the upper promises breathability, flexibility, and support. The shoe model is available in a colorway that appeals to those who love aqua blue basketball shoes. Under Armour Longshot. The Under Armour Longshot comes with a soft leather and mesh upper. It has a unique asymmetrical lacing system for a secure lockdown. These light blue basketball shoes prioritize comfort with its Charged cushioning. Reports mention that the shoe rocks like the Curry 2 at a more affordable price. Under Armour Rocket. This shoe model is definitely a pride of Under Armour. The Under Armour Rocket is an affordable beast on court. At $100, who would expect that it can perform just like the Kyrie 2 or the Kobe 9? For step-in comfort and responsiveness, the Under Armour Rocket gives wearers the Micro G sockliner and midsole. Pliable and soft synthetic leather make up the upper. For a worry-free dash on court, the outsole features a full-length herringbone. Under Armour Drive 4. 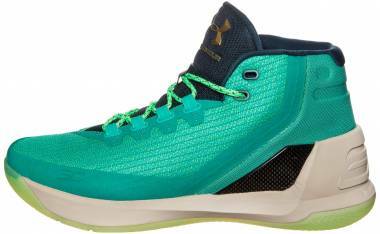 The Drive 4 is a reasonably priced pair of Under Armour basketball shoes. Besides the price, wearers have many other reasons to love this sneaker. Its outsole grips well on any court thanks to the widely spaced herringbone. Aggressive footwork is kept stable and well-supported by the shoe’s external counter. A secure lockdown is taken care of by the shoe’s high collar and standard lace-up system. The shoe’s lightweight mesh upper keeps the foot moist-free. The Under Armour Drive 4 is manufactured in different shades of blue. 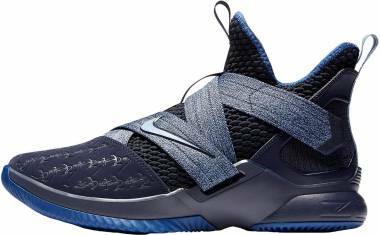 Some of these blue basketball shoes have white outsoles that contrast with the strong masculine hue of the upper. Anta KT 2. The Anta KT 2 breaks the belief that translucent rubber outsoles are only for indoor play. The brand does it by outlining the outsole with the unbeatable herringbone pattern. Anta uses basic EVA for the midsole and equips it with two high-density foams. The stylish TPU heel counter of the Anta KT 2 resembles the head of a hawk. As part of the GSW family, Klay Thompson of course has different shades of blue basketball shoes in his line. Anta Light. The Anta Light may not be as attractive as other signature kicks but these Klay Thompson basketball shoes have many qualities that wearers enjoy. The lightness of the signature shoe is designed for training, gym workouts, jogs, and casual use. The basic EVA foam gives wearers a bouncy and comfortable midsole. With the Control-5WD technology, the outsole takes after the contours of the foot, allowing a better floor grip. A half-bootie with a mid-top silhouette, the mesh upper is made durable by synthetic leather overlays. 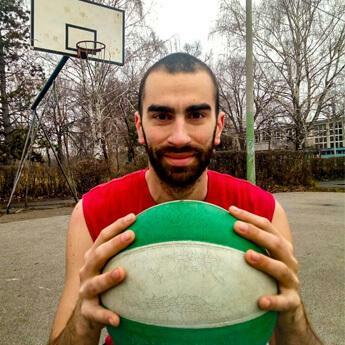 Anta KT 3. The last shoe of Klay Thompson for 2017, the Anta KT 3 is a high-top shoe with a knit upper with fuse and nylon reinforcements for durability. The signature shoe carries an EVA foam midsole with high-density pads at the forefoot and heel. The outsole boasts a circular traction pattern similar to a fingerprint. KT’s shoe models never fail to have a colorway that pay homage to his Golden State Warriors. These blue basketball shoes are accented with yellow and white. The Anta KT 3 also has a lighter version. Anta KT Outdoor 2 Low. Quality shoes at a lower price, this is what Anta is known for. Featuring the new A-Shock stabilizing technology, the special high polymer midsole of the Anta KT Outdoor 2 Low delays impact and gives high energy returns. 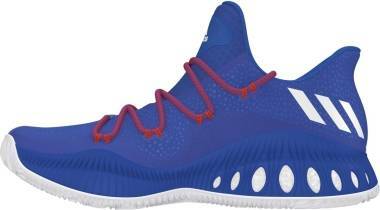 Implied to be designed for outdoor use, these blue basketball shoes comes with a specially designed abrasion-resistant rubber called the A-HARDCOURT RB, which has a firm grip even on dusty courts because of the blade-like pattern on it. One downside is that the outsole needs wiping from time to time to maintain its superb performance. The low-top construction of the shoe provides enough stability and an incredible amount of support. The shoe has a perfect one-to-one fit locked with a standard lace-up system and a TPU heel counter. 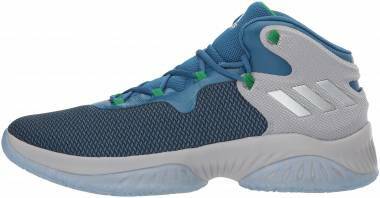 The Anta KT Outdoor 2 Low currently comes as dark blue basketball shoes with accents of orange and mint green. Anta KT Light 3. Even if it is not considered a spectacular basketball shoe, the Anta KT Light 3 is recommended by many buyers. Here’s why. The shoe model promises lightness, comfort, flexibility, and affordability. Casual wearers, gym goers, runners, and those who train prefer these blue basketball shoes. Packed with a full-length A-Shock midsole, impact is absorbed and torsional twists are prevented with the aid of the Auto-Arch thermo polyurethane shank. The signature shoe also has the A-StableUp technology that serves as an outrigger at the lateral side of the forefoot, preventing ankle rolls. 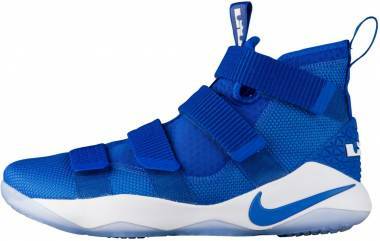 Wearers who love blue basketball shoes are accessible may want to cop the Light Cavalry colorway. After Adidas acquired Reebok, the NBA and WNBA deals and contracts of the Vector brand were taken over by the Three Stripes brand. However, a few signature basketball athletes have lifetime endorsement deals, which oblige Reebok to continue manufacturing shoes for them. These basketball shoes will be retroed time and time again because of their historical value. These re-releases come with new colorways that attract more fans and buyers. Reebok Shaqnosis. Shaquille O’Neal’s favorite shoe in his line, the Reebok Shaqnosis is made of perforated leather that is adorned with concentric circles that are meant to hypnotize opponents. The midfoot has seven pairs of eyelets, just enough to lock the foot down. 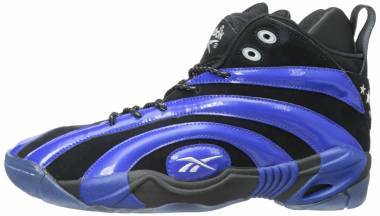 Reebok basketball shoes including the Shaqnosis are known for their Hexalite cushioning technology. Located at the forefoot and heel, this lightweight cushioning system delivers impact protection. 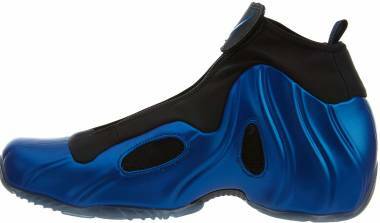 Currently, the Reebok Shaqnosis comes as blue basketball shoes in different shades. Reebok Shaq Attaq. The Reebok Shaq Attaq is one iconic shoe. Though it can no longer be played as much as the more modern shoe models, true Shaq fans deliberately purchase a pair for collection and/or casual use. In a true classic fashion, the Shaq Attaq features the undisputed herringbone traction pattern. Thick and wide grooves grace the forefoot and heel areas. The center has a Graphlite shank plate for stability. As the first to have the Pump Technology, the famous signature shoe comes with a personalized cushioning and fit. The sleek upper is covered in mesh and leather combination. The Reebok Shaq Attaq comes in many colorways that wearers who love electric blue basketball shoes will truly appreciate. Reebok Kamikaze II Mid. Either on a solid or translucent rubber, the Reebok Kamikaze II Mid boasts a wavy herringbone traction pattern with a wide flex groove at the forefoot. Dusty and outdoor courts do not stand in the way because this shoe provides sufficient surface grip and control. The outsole also gives a peek to the honeycomb pattern of Hexalite technology used in the midsole. 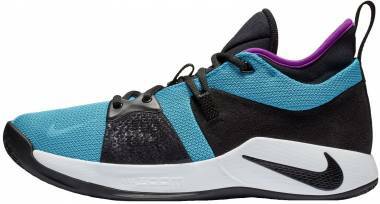 Styled with a synthetic leather upper, this model may come as blue basketball shoes in different shades. The “White and Volt” and “Grey, Turquoise, and Purple” colorways are two of its most basic releases. When it comes to collaborations, the Reebok Kamikaze 2 Mid Year of the Snake colorway stands out with its snakeskin-like purple and aqua blue upper. Blue: What Does It Stand For? Why do most basketball teams opt for the color blue? Why do more than half of all the teams in the male-dominated NBA have blue accents in their jerseys? Even in companies, why is blue such a popular color in their logos? What does blue imply exactly? Blue is a such a cool color that other hues can easily blend or match with it. It often depicts the clear skies and the calm seas. Symbolically, it denotes success, peace, loyalty, trust, intelligence, confidence, faith, and all the positivities. However, blue may psychologically mean icy, distant, or cold but non-threatening. Blue started to become the color for boys after the World War II, in an era now referred to as the generation or time of the baby boomers. The color was embraced by the military and other authorities as a symbol of trust. For marketing purposes, companies started to assign blue for boys and pink for girls. Going back to the NBA, blue takes the center stage once more as the Golden State Warriors become the 2018 NBA Finals Champion. Their team colors are royal blue, California golden yellow, and slate. Their other triumphant years are 2015 and 2017. As far as they are concerned, blue is a sign of reliability, security, and stability. Basketball sneakers are like jewelry; they are lovely to look at and nice to wear. They need to be protected against wear and tear. With their steep prices and historical values, shoe owners must know how to properly take care of them. Insert a shoe tree in each shoe to keep the shape of the toe box as you put pressure when brushing. Fill a Reshoevn8r collapsible cleaning bowl with water and a little bit of the Reshoevn8r Advanced Shoe Cleaner/Conditioner. With a paper towel or soft cloth, remove excess mud or dirt on the shoe. Remove the shoe laces. They are to be washed separately using the Reshoevn8r Advanced Shoe Cleaner/Conditioner. Start with the suede brush. It lathers easily. Gently brush for a quick clean. Next, use the All-Purpose Brush, which has stiffer bristles to clean the shoe better. Avoid putting too much pressure, let the brush do the work. Leave the shoe for five to ten minutes so that the solution can soften the stubborn dirt. Using the Sole Brush, brush the unpainted midsoles and outsoles. The brush is not recommended for painted midsoles. It can scratch the area. Brush the soles well to get good results. Using the Reshoevn8r Microfiber Towel, wipe off all the lather. Check the areas that need re-cleaning and repeat the process. Sleek shoes are not to be worn with baggy clothing. When wearing sleek blue basketball shoes, baggy pants are a no-no. Sleek shoes are beautifully designed to be put on display. It is recommended to have the tip of the pants just above the ankle collar. Do not wear different brands at the same time. Imagine a guy wearing a Reebok cap, a Nike shirt, a pair of Adidas jogging pants, and rocking a pair of Anta basketball shoes. He surely looks like a war of brands or perhaps a walking department store. Yes, this stands out in the crowd, but in a negative way. Sneaker fanatics advise a maximum of two brands: like a Nike shirt and all blue basketball shoes from Adidas. But there are some who cringe if the brand of the socks worn are different from that of the basketball shoe. Make sure to check yourself in the mirror before leaving the house. There are so many ways to style blue basketball shoes. However, no matter how expensive the items paired with the footwear are, they need to be kept clean for a nice and decent getup. Signature basketball shoes are typically expensive upon release especially if they are from huge brands. Fortunately, the prices of blue basketball shoes drop as months go by. Just give it around three months and the price of a coveted sneaker will most likely drop at least ten percent. Shopping for blue basketball shoes should have proper timing. If good deals or promotions are sought after, do some online research or visit some shoe outlets when you get the time.